Bestselling Amish fiction author Jerry Eicher recounts his personal experience of an Amish community and its influences. Jerry S Eicher’s ‘My Amish Childhood’ opens with all the rural atmosphere and close family tradition you’d expect of an idyllic Amish country novel. But this is no made up fantasy. This is the real life story of two Amish families told from the recollections of one of its youngest members. Now matured into one of the most authoritative and engaging of Amish writers, Jerry S Eicher reveals the joys of an Amish boy and the hardships of a family focused community trying to forge a new – yet still traditional life, in a foreign land. ‘My Amish Childhood’ takes you from the Amish homelands to an Amish community ‘plant’ in Honduras; where the solid hard work of a plain people meets the colour and vitality of a Latin culture. It’s a true of story of hardship and happiness, triumph and tragedy as the best efforts of a Godly community struggle to establish a foothold in a foreign land. Jerry relives his school days in the Amish community of Aylmer, Ontario and the move to Honduras. He shows you life in a beautiful, Central American Amish community seen through a boy's eyes, explains the family’s return to America and shares his life changing conversion to Christ and its effect on his childhood traditions and faith. This is a book that fills out much of the essential background to Amish life and culture that will enrich your reading of novels, faith based fiction and other historical accounts set in the romantic Old Order Amish landscapes and communities. My Amish Childhood by Jerry S. Eicher was published by Harvest House in February 2013 and is our 16690th best seller. The ISBN for My Amish Childhood is 9780736950060. Be the first to review My Amish Childhood! Got a question? No problem! Just click here to ask us about My Amish Childhood. 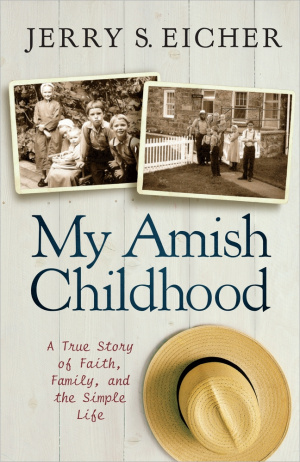 Bestselling fiction author Jerry S. Eicher turns his pen to a moving memoir of his life growing up Amish. Jerry's mother was nineteen years old and nine months married when he was born. She had received Grandfather Stoll's permission for the wedding because she agreed to help out on the farm the following year. However, with Jerry on the way, those plans failed. Jerry recounts his first two years of school in the Amish community of Aylmer, Ontario and his parents' decision to move to Honduras. Life in that beautiful Central American country is seen through an Amish boy's eyes - and then the dark days when the community failed and the family returned to America, much to young Jerry's regret. Jerry also tells of his struggle as a stutterer and his eventual conversion to Christ and the reasons for his departure from the childhood faith he knew. Here is a must-read for not just Jerry's fiction fans, but also for readers curious about Amish life. "Jerry Eicher's books are among some of my favorite reads and I was really excited to find this one. Jerry tells of his years growing up in an Amish settlement in Honduras… This is a wonderful historical account of one Amish group's experience. It was very fascinating to me." "An interesting memoir for readers of Amish fiction and those interested in the evolution of the Amish faith. Jerry grew up in the Amish family that started the Pathway Amish publishing house. His family pioneered an Amish community in Honduras. His memoir does a lot to de-mystify the Amish way of life." Jerry S Eicher, author of ‘My Amish Childhood’ was born in 1961 to a 19 year old Amish girl following a marriage contract that committed his mother to continue working on her father’s strawberry farm. But, arriving only a few days after the wedding baby Jerry reduced grandfather Stoll’s plans lay in tatters, and the new born innocent carried a burden of guilt that would haunt his later life. Grandfather Stoll although jolly, was a regal with a quick temper that knew no distinction on rank or station – family, friends and even bishops alike suffered the fiery outbursts of his rage. In the end, it was the old grandfather who would change the family’s fortunes. Grandfather Stoll had married the sister of an Amish intellectual who founded an Old Order Publishers, ‘Pathway Publishing’, with some of the old man’s sons. Jerry’s paternal grandfather - Eicher, ran the company’s print shop and worked the machinery. Jerry’s parents lived in the Stoll house until his father built the growing family of five a house near the Amish school. Jerry paints a detailed and revealing picture of Amish domestic, educational and working life. The house of his family and grandparents is the focus for an existence that is plain, hard and satisfying simple in its joys and pleasures. Life looks set to continue in the time honoured Amish tradition until a dull glow red is seen on the horizon. Only later does Jerry learn that, a cooking accident in grandfather Stoll’s house had caused an explosion and a catastrophic fire. Although no one was hurt, his mother’s family home had been reduced to ashes. The community rallied around to rebuild the old man’s house, but the fire had kindled a new idea in the patriarch’s mind – a calling to mission. An outsider, an ‘Englischer’ had told the grandfather of a children’s home mission begun in the South American country of Honduras. At the same time, an Amish ruling – an ‘ordnung’ was about to have a severe impact on Jerry’s father’s construction business. Against this background, the families set in motion a search for land in Honduras where they could settle and begin a new life and found a new Amish community. In 1968 the Stoll-Eicher families and others that joined their exodus to a new Canaan took possession of the 550 acre Finca Sanson farm 3000 miles away and 3000 feet up a 3500 foot mountain. This is the setting for Jerry S Eicher’s ‘My Amish Childhood’; his Honduran adventure and his return to the Amish homeland when the dream eventually evaporated. The book is an unusual insight into the workings and relationships within and without the ancient community, its struggles to survive and the resilience and determination of its members. It’s about loyalty faith and discovery. Jerry S Eicher was born and raised in an Amish Community in Ontario and a child member of an Amish community colony in Honduras; which makes him uniquely qualified to write the way he does. Jerry Eicher’s bestselling Amish fiction (more than 210,000 in combined sales) includes: The Adams County Trilogy, the Hannah’s Heart books, and the Little Valley Series. After a traditional Amish childhood, Jerry taught for two terms in Amish and Mennonite schools in Ohio and Illinois. Since then he’s been involved in church renewal, preaching, and teaching Bible studies. Jerry lives with his wife,Tina Eicher, and their four children in Virginia. Jerry S Eicher’s ‘My Amish Childhood’ is the real life story of two Amish families told from the recollections of one of its youngest member. Now one of the most authoritative and engaging of Amish writers, Jerry S Eicher reveals the joys of an Amish boy and the hardships of a family focused community trying to forge a new – yet still traditional life, in a foreign land. ‘My Amish Childhood’ takes you from the Amish homelands to an Amish community ‘plant’ in Honduras; where the solid hard work of a plain people meets the colour and vitality of a Latin culture. This book fills out the essential background to Amish life and culture that will enrich your reading of novels, faith based fiction and other historical accounts set in the romantic Old Order Amish landscapes and communities.